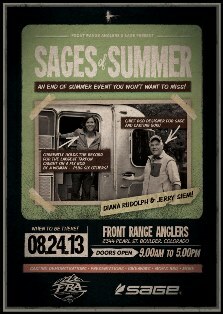 If you’re in the Colorado Front Range area, make time to head over to Front Range Anglers on Saturday August 24th for casting demonstrations and presentations by Diana Rudolph and Sage head rod designer Jerry Siem. Join us for a special end of summer event on Saturday, August 24th! We’ll be hosting two amazing members of the fly fishing world, Jerry Siem and Diana Rudolph! First up is Jerry Siem, Chief Rod Designer for Sage. Jerry has had a long and lustrous career with many rods attributed to his design. Jerry will be giving an insightful presentation on the world of rod building, how the new Sage METHOD was designed, and where the future of rod materials is heading. You’ll also want to make sure to catch his casting demonstration in the morning. If there has ever been anyone that makes a rod look like it is just an extension of their body when casting, Jerry is the one! Ever wonder who made Brad Pitt and Craig Sheffer look like casting pros in the movieA River Runs Through It? Yep, you guessed it, Jerry was a casting consultant and stand in for some of the scenes! We’ll also have world-renowned record holder Diana Rudolph in-house all day! She’ll be giving a presentation about how she grew up fishing in Islamorada, FL and proceeded to rack up seven current I.G.F.A records on the fly rod, including the largest Tarpon caught by a woman! If we’re lucky, she might even tell us why she enjoys chasing records so much and what it’s like to be “just one of the guys” on the boat and then leave the guys speechless when she consistently brings in the biggest fish of the day! These days she’s also taking her game to the freshwater fish, so look for her name to be in the spotlight again! Diana will also be giving a casting presentation in the afternoon! She’ll show you what techniques she uses to put a fly on a dinner plate to a laid-up Tarpon or resting Trout that’s way out there! In addition to all of this we’ll have Moe’s Original BBQ here over lunchtime with some delicious $1 pulled pork sliders and some brews from our friends at Upslope and Redstone Meadery to wash it all down! Jerry began working at Will Godfrey’s original fly shop on the Henry’s Fork and developed a real talent for building rods. His first salt water experience came in the mid ’70′s while tarpon fishing with a hefty fiberglass rod aboard Captain Ralph Delph’s Vitamin Sea. The lure of salt water soon led Jerry to Belize, Baja, the Bahamas, Christmas Island and up and down the east and west coasts of the US. In the Keys he once caught a permit and bonefish on modern graphite rods and completed the grand slam with a 90 pound tarpon caught on a cane rod which he had designed specifically for the task! He was the on site casting consultant for Tom Skerritt, Brad Pitt and Craig Scheffer in the movie “A River Runs Through It.” Jerry is one of the finest fly casters on the planet and lives in Washington State where he is the resident rod designer for Sage. Diana’s first encounter with a tarpon left her “trembling with excitement.” After receiving a B.A. in Biology and attending graduate school, she returned to her passion of fly fishing and dominated women’s bonefish and tarpon fly fishing tournaments in the Keys for a decade. In 2004 Diana became the only woman to ever win the prestigious 30 year old Don Hawley Invitational Tarpon Tournament. She currently holds seven I.G.F.A. fly division records including the largest tarpon ever caught on flyrod by a woman. She is a contributing writer for Fly Fishing in Saltwater magazine and on the advisory staff for Sage rods and Rio Products. Diana is a member of the Board of Directors for the Federation of Fly Fishers and splits time between the flats of the Keys and the rivers and streams of Montana.